In light of a recent post which gathered a good deal of attention, I thought I should deal with certain misconceptions over what I actually believe. Since some atheists and some Christians seem to be under the impression I reject the authority of Scripture and of the Church. Because of this I want to make a formal statement on this subject. Do I Believe Scripture Contains Error? Answer: No. I believe Scripture is Inerrant. My disputes are not over the words of Scripture. Rather, my disputes are with those personal interpretations of Scripture which insist on being treated as Doctrine. I do believe certain Christians misunderstand the idea of genre when it comes to reading Scripture and draw a meaning the Bible never intended to give. I formally reject the idea the Bible is only symbolic or myth and repudiate any other view which claims Scripture contains error. Do I Believe The Catholic Church Errs? Answer: No. 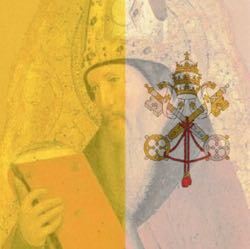 I accept and submit to the authority of the Magisterium of the Catholic Church under the Successor of St. Peter, Pope Benedict XVI, and do my best to keep to the teachings of the Church. I do not go against the authoritative teaching of the Church and seek to constantly improve my understanding of her teachings to keep rooted in the Catholic faith. That being said, I wish to also state that the Magisterium is living. It does not contradict itself, but it can deepen the understanding of a teaching. So we need to understand that the Current Successor of St. Peter has the authority to interpret the teachings of the Church in a binding way, but the Catholic in the pew does not. This is why, when a radical traditionalist or a Young Earth Creationist Catholic cites an older council of the Church and accuses the the modern Magisterial teaching of contradiction, I accept the teaching of the Magisterium over the so-called interpretations of the individual. What Do I Believe on Creationism, Evolution and the Teachings of the Church? I believe that Genesis intended to affirm the truth that all creation is from God, and nothing exists which God did not will to bring into being. However Scripture does not say how God chose to create the universe and all that which is in it. Those who consider evolution have to consider both arguments for and against it. We are to always submit to the Church should it make a ruling. Because the Catholic Church does not forbid a belief in evolution that accepts God as the cause of all which exists, those who claim Catholics that accept the possibility of evolution are heretics do not speak for the Church, but instead are guilty of rash judgment if they assume without proof that Catholics who believe in evolution deny the authority of the Church or the Bible. I formally reject as false and unjust any accusation which claims I deny the authority of the Church or the inerrancy of Scripture. I do submit to the Church with an act of will. I will never disobey the Church and seek to avoid all instances of accidental departure from her teachings. Were the Gospel Accounts Myth?